What would Brexit mean for UK science? Around 10% of UK public funding for research comes from the EU. So what would leaving mean for UK science? As with everything EU-related, it’s complicated, but the consequences of Brexit are most likely to be bad news for public investment in research in the UK. Whether through reduced access to EU funding or a knock to economic growth, it’s likely that there would be less money available for science if the UK votes to leave the EU on June 23rd. Research is a significant component of the EU Budget, and this EU research funding also forms a significant component of the UK research landscape. There are two reasons for this. Firstly, UK scientists are very good at winning EU funding: we pay in around £12 per person per year, but we receive £15 per capita in grants. As well as being an endorsement for UK science, this is a net win from EU membership. Secondly though, the UK invests far less in science than many other countries. This means that extra EU money forms a larger and more important part of the UK’s research portfolio than it does elsewhere. Whether we would lose access to this money entirely is not certain, and would depend on the terms of our relationship with the remaining EU member states. Non-EU countries such as Switzerland, Norway and Israel do participate in EU research funding schemes, but the exact terms of their relationship depend on adherence to EU principles such as freedom of movement. Depending on UK policies and the outcome of negotiations, a post-Brexit UK may not be able to collaborate under the terms we currently enjoy. However, even in the worst-case scenario of a total withdrawal from EU schemes, £15 is clearly less than our £90 per capita net contribution to the EU. 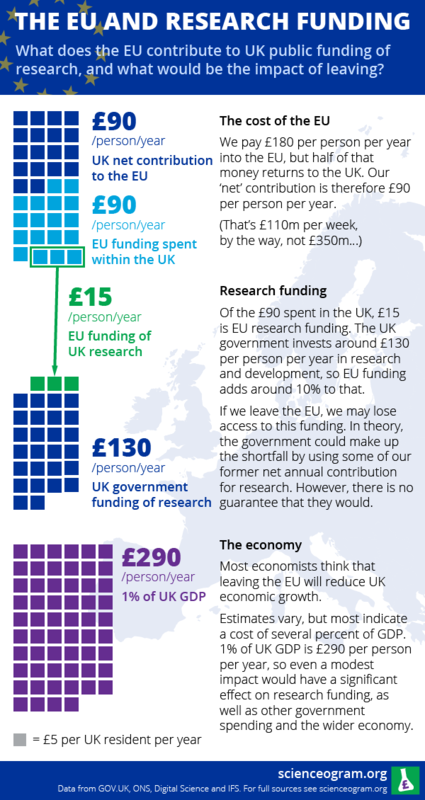 Were we to leave the EU, it looks as though the government could make up the missing research money from this saving. The first question is whether this would actually happen. Whilst EU funding for science is rapidly increasing, the UK government has presided over a Science Budget which has fallen by every measure since 2010, and research in many government departments has also seen substantial reductions. Furthermore, science is just one of a string of areas which Vote Leave has suggested could be recipients of the cash. The second issue is the overall state of the economy. The majority of economists predict that leaving the EU would cause an immediate period of uncertainty, followed by a longer-term reduction in economic growth due to reduced trade and freedom of movement, though this too depends on the details of our post-EU settlement. Predictions for the impact of leaving are almost uniformly negative, with most organisations forecasting a loss of several percent of GDP. Without committing to a particular estimate, we can provide a frame of reference for these figures: 1% of GDP is around £290 per person per year. That’s twice the UK’s net contribution to the EU, and twice our total public funding of R&D, so even an unexpectedly modest shock could have serious implications for science, as well as many other areas of government spending and the wider economy. Finally, this very reduction in funding for UK research and innovation caused by leaving the EU could itself have negative economic effects, leaving us less able to make inroads in the current productivity crisis, encourage private companies to invest in R&D in the UK or tackle social and environmental challenges through research. Research funding post-Brexit would therefore be at the mercy of UK government policy, deals struck in negotiations, and conditions in the wider economy, and none of these gives cause for optimism. So, if you’re concerned about science, a vote to remain is very likely to be the safer option. All the data and calculations we used for the infographic and the article above can be found in a Google Spreadsheet.